We all know that feeling when we want to book a dining reservation that we think will make our vacation so magical. Sometimes it’s the menu that draws us, or the characters, or the ambiance. A meal you’ve eaten there, your child’s favorite hero (or villain), or the magical snow falling in the background. However, chances are, we aren’t alone in coveting this dining reservation if we want it so badly. 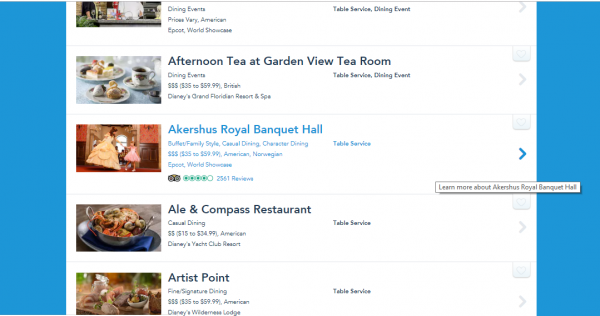 There are close to 100 table-service dining locations at Walt Disney World but with tens of thousands of guests that visit each week, the competition is stiff for some of the most popular dining reservations. Dinner at Be Our Guest come to mind? Once upon a time, one of the most sought after reservations was Le Cellier, the steakhouse in the Canada pavilion at Epcot. Since becoming a signature dining location, Le Cellier has not been as difficult to book as it once was. In fact, I was able to book a family of four on ten different occasions for dinner (prime time no less) within 45 days of dining. That used to be unheard of. 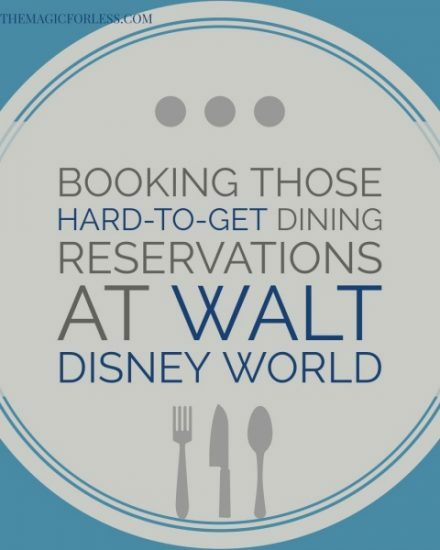 Today, the reservations that can prove tricky to secure are the aforementioned Be Our Guest, which accepts reservations for all three meals despite breakfast and lunch being quick-service type experiences, and dinner being the latest addition to the signature dining list. Both breakfast and dinner at ‘Ohana are among the popular. Cinderella’s Royal Table is still sought after – I mean you dine inside Cinderella Caste – really the only way to experience the interior of the Castle, and the food is very good if you ask me! 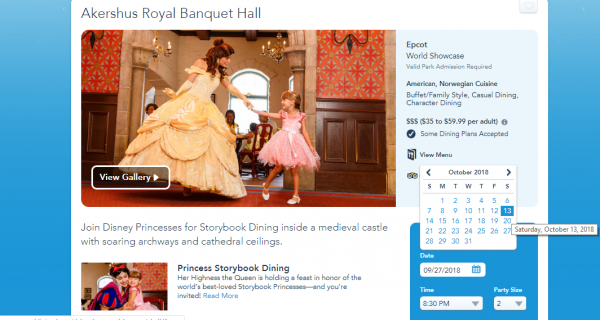 Another encounter with the princesses at Akershus Royal Banquet Hall in the Norway pavilion at Epcot, also proves to be tough to book most days. Cinderella makes one more appearance in the dining setting causing reservations to be harder to come by, at the Grand Floridian’s 1900 Park Fare. One of the most successful tips for finding availability at these hard-to-get locations, is to book them late in your trip. Resort guests know the number 180 means everything. 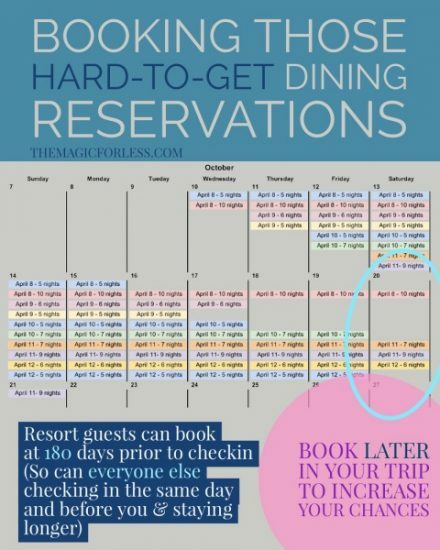 At 180 days prior to check-in, guests staying at a Walt Disney World resort hotel, can book their dining for their stay up to 10 days. It’s also considered the 180+10 rule. When you log into your My Disney Experience account 180 days prior to your check-in date, hundred of other guests are doing he same. If you all try to book Be Our Guest on the first or second night of your trip, you’re all competing against each other. And not only are you competing against everyone checking in the same day as you, but everyone who is checking in 1-9 days prior to you. Their travel dates are overlapping yours too. 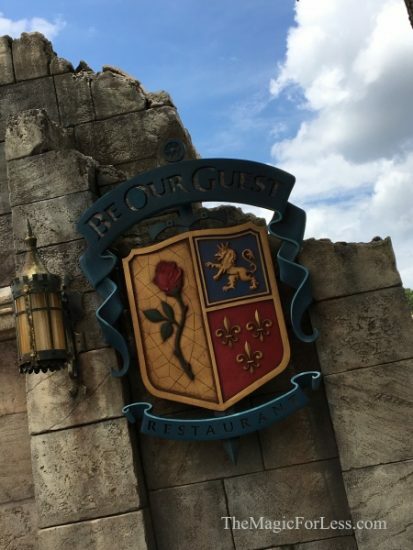 Realistically, more often than not, Be Our Guest will be unavailable on your first or second night, but if you try to book it on the 6th night of your stay, less guests have had access to that date. This is the best strategy for your hard-to-get reservations. You simply increase your odds by lessening your competition. 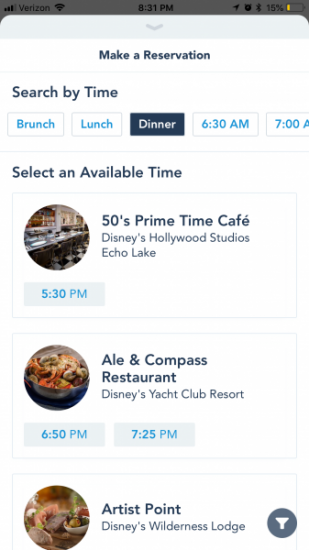 This strategy also translates to FastPass+ selections at your 60-day booking window (think Flight of Passage, Slinky Dog Dash, and 7 Dwarfs Mine Train). In this example, guests are booking reservations in October for their April stays. There are two parties checking in each day from April 8th to April 12th for various lengths of stays. You can see how the parties are competing against each other earlier on in the trip. 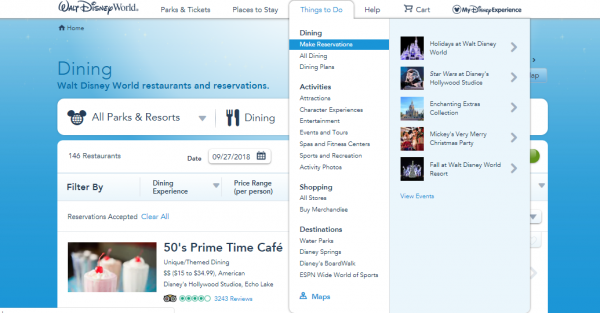 I also suggest you use the browser version of My Disney Experience when making your reservations. From the mobile app, you can select your party size, date, and time, but you receive very broad search results. You’d have to go day-by-day to find availability at the one location you want. If you use the browser version, you can go directly to the dining location’s page and then search by party size, date, and time. Don’t know the date of your booking window? Use this great Disney date calculator! For more tips and first-class service planning your memorable vacation, send me an email at jocelyn@themagicforless.com or fill out a no-obligation quote request to get started! And be sure to follow me on Facebook! There hasn't been a time in my life where Disney wasn't at the core. Now it's a family obsession. I'm blessed with a wonderful husband and three girls who appreciate Walt Disney World for everything it is. When we are not there, we are reminiscing or planning the next trip(s)! I love to talk Disney, run, read, and spend time with my family. I'm so blessed to be an Annual Passholder, DVC Member, BOGP Lizard, and Travel Agent with The Magic for Less!